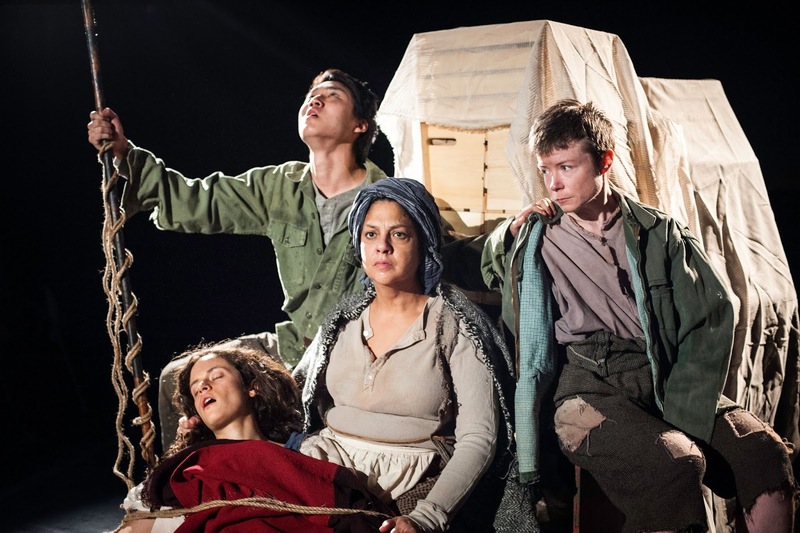 "Pangea World Theater’s take on Brecht’s classic, Mother Courage, is a scathing critique of profiteering through war and misfortune. As relevant today as when it was written, Mother Courage follows a woman determined to make her living from war at any cost. Over the course of the play, she loses all three of her children to the very war from which she tried to profit." Considered one of the greatest plays of the 20th century, Mother Courage and Her Children was written by Bertolt Brecht in 1939 in response to the rise of fascism in Europe, but set in 1624 to 1636 during the Thirty Years' War. Mother Courage is hailed as one of the greatest plays of the 20th century. Although productions are fairly rare in American theater, some of the most well-regarded contemporary playwrights have adapted the play, including Ntozake Shange, Hanif Kureishi, David Hare, Lee Hall, and Tony Kushner. Pangea's production uses the 1972 adaptation by acclaimed translator Ralph Manheim. In addition to tackling a weighty subject, Brecht is a challenging playwright. Pangea's program, which includes analysis and background by dramaturg and literary director Meena Natarajan, as well as a timeline and glossary, is well worth a pre-show (and after-show!) read. A bit more backstory about Brecht's dramatic theory of isolation, or verfremdung. Trust us, this is good to know going in. Brecht uses the word "alienation" (verfremdung) to describe his method of helping the audience to be receptive to his dramatic intentions. His technique of alienation includes elimination of most conventional stage props; use of charts, slides, and messages flashed on screens; direct involvement of the audience through characters who step out of their roles to function as commentators; and many carefully planned incongruities. Finally, Brecht requires that actors work in a new way: they must not identify with the dramatic characters but, on the contrary, must always demonstrate that they are playing a role. Alienation is Brecht's fundamental dramatic device, and his parody is of course closely dependent on this technique. This is not an easy play due to Brecht's distancing theories. And knowing that we are not to identify with the characters is a bit at odds with contemporary American culture and the value placed on likability. But one of the things we love about Pangea World Theater is that they don't play it safe. Pangea's production of Five Weeks: A Play About Divided Hearts, a fascinating story about the heartrending and complicated personal stories from Partition still lingers in our minds. Mother Courage and Her Children will stay with us for a long time as well. Director Dipanka Mukherjee's production reveals more complexity and layers the more we consider it. Our production of Mother Courage features a diverse ensemble, and presents a fresh perspective on this traditionally Euro-centric piece. Exposing the oft unrecognized impacts of war on women, LGBTQ2A+, and indigenous, black and brown bodies, we uplift these voices, and empower artists to connect to their own truth in this historical text. Despite Brecht's challenges for the actors, the marvelous and diverse ensemble create a number of engaging characters. Standouts in the cast include Stephanie Ruas, Mother Courage's mute but profoundly expressive daughter and Marcele Michelle, who plays a number of distinct and diverse characters and also sings a lovely, stirring "Lo, How A Rose E'er Blooming." Ricardo Beaird as the cook/soldier brought vitality to every scene, and Clay Man Soo, as Mother Courage's son Eilif, was virtually unrecognizable from his delightful character in Theater Mu's A Korean Drama Addict's Guide to Losing Your Virginity. Although the set design by Orin Herfindal was minimal, the sound design (by Eric M.C. Gonzalez) was ambitious and complex. Sadly, the acoustics of the Lab Theater combined with the sound design and music made it challenging to hear and understand the cast at times. This is a show which would have definitely benefited from Brecht's recommendations to use charts, slides, and messages flashed on screens. Open captioning would have been immeasurably useful to stronger understanding of the play. Seeing this made us wonder how other recent Mother Courage productions have been received--say, the 2006 Delacorte Central Park production starring Meryl Streep. Ben Brantley in the New York Times wrote that Mother Courage "is one of those great plays that almost never play great — at least, not in English. The necessary combination of detachment and engagement is as hard as anything in modern theater to get right." Classic Stage Company's 2016 production set in both the Democratic Republic of Congo and the Republic of Congo got a rave from Charles Isherwood at the New York Times, despite the last-minute departure of Tonya Pinkins from the production due to creative differences. And, of course, Lynn Nottage's 2009 play Ruined is inspired by the Brecht classic. Mother Courage and Her Children is a fascinating work with a rich and complex history, and it's exciting to see Pangea's take on the play. Accessibility: The Lab Theater has parking spots reserved in the lot across from the theater for a $5.00 fee (pay at the box office). Several flights of stairs lead down from the box office to the performance space, but there is an elevator available. Restrooms are on the box office level. The front row of seating for this show does not require steps, but the majority do and there are no handrails.